Peak Jersey Royal season doesn’t last long, so it’s worth making the most of their special flavour while you can. This tart can be served warm or at room temperature. 1. Preheat the oven to 180°C, gas mark 4. Simmer the potatoes in a pan of boiling, salted water for 10 minutes, until just tender; drain and set aside. Meanwhile, make the pastry base in a 20cm loose-bottomed tart or sandwich tin. Cut the filo sheets in half and place one by one into the tin, brushing in between each with a little oil (1 tbsp in total), and overlapping at different angles. 2. Heat the remaining 1 tbsp olive oil in a frying pan. Add the salad onions and potatoes, season and fry for 3-4 minutes; set aside. 3. In a jug, whisk together the crème fraîche, eggs and mustard; season. 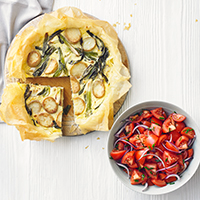 Scatter ½ the potatoes and onions into the tart case, pour over the egg mix and top with the remaining veg. Bake on a baking sheet for 20-25 minutes, until set and just golden on top. Serve warm or at room temperature, with a tomato salad, if liked. This recipe was first published in Mon May 23 11:52:00 BST 2016.